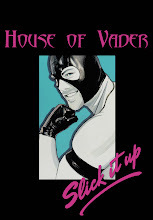 You can pick the shirt up at SLICK IT UP for a discount using coupon code "houseofvader". Its black ink on a navy blue tee. You can also see more of Exterfaces work HERE.